American Enterprise Institute scholar says that despite all the various attempts to repeal and replace the Affordable Care Act, value-based care and payment model is the clear path forward. CHICAGO -- Washington is missing the point on health insurance and it’s not likely that Congress will pass any major legislative changes in the next year. That’s according to Joseph Antos, a scholar at the Washington, D.C.-based think tank American Enterprise Institute. Amid all the back-and-forth over failed bills to repeal and replace or just overturn the Affordable Care Act, however, Antos and other speakers said that regardless of what happens inside the Beltway, value-based care and payment models are the clear path forward because adjusting cost-sharing is likely to drive behavioral changes that lead to better care at lower costs. To that end, Antos laid out his principles of value during the morning’s opening keynote. We have to find a way to move from simple-minded fee-for-service. Instead, the focus needs to be on providing services toward more appropriate utilization. Providers have to integrate care delivery. The days of Marcus Welby, MD, making house calls with an armamentarium holding a thermometer and stethoscope and essentially operating in isolation are over. “Policy makers often live in that kind of past and the fee-for-service system is rooted in that, too,” Antos said. Healthcare providers must measure cost and outcomes for patients and make big data work. The industry has to make ‘doing the right thing’ worth the effort of customers, providers, insurers. Policymakers: Don’t lock us into mistakes we’ve already made. Antos pointed to the ACA shifting authority from Congress to the Executive Branch and efforts to post prices of care services without making them clear enough for customers to actually understand as two recent examples. This was one of our most popular stories of the year. 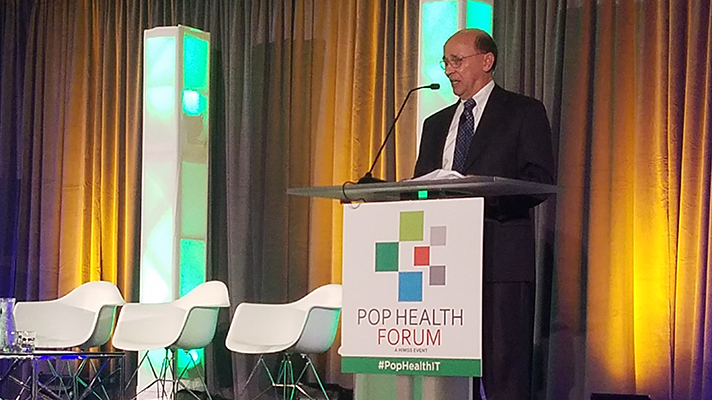 Read our coverage of HIMSS Pop Health Forum in Chicago.